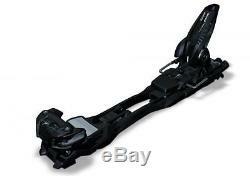 2015 Marker Duke EPF 16 Small 265-325mm Black/Black 110mm Ski Binding. The Duke features Marker's Extended Power Frame chassis, 28% wider than the original. For the big mountain freeskier who wants an easy climbing function combined with the ultimate in security and performance for coming down the mountain. Binding Included: Marker Duke EPF 16 Small Binding. DIN Range:6.0-16.0. We sell skis, snowboards, helmets, sunglasses and goggles. ASOGear buys directly from the manufacturers and is dedicated to getting our customers great products for amazing prices. With a dedicated team of knowledgeable staff, we stand behind our products and our service 100%. We are unable deliver to P. Manufacturers provide warranties against defects and workmanship only. Please see individual manufacturers websites for detailed information regarding specific policies. It will be your responsibility to send it back to our location in Oakville, Ontario, Canada at your cost. We must receive returning goods within 30 days of issued RA #. Boot and Binding boxes must not be defaced, charges may apply. If you are returning the item due to a mistake on our part, we will make all efforts to correct the situation. Once we receive this we will reply to you with a Return Authorization number and instructions for returning the product back to us in Oakville, Ontario, Canada. We require all returning packages to clearly state the RA # and "Returning Goods" on the packaging. Do not return any product prior to receiving RA # or you will not receive any compensation. This listing is currently undergoing maintenance, we apologise for any inconvenience caused. The item "2015 Marker Duke EPF 16 Small 265-325mm Black/Black 110mm Ski Binding" is in sale since Monday, February 13, 2017. This item is in the category "Sporting Goods\Winter Sports\Downhill Skiing\Bindings". The seller is "asogear" and is located in Oakville, Ontario. This item can be shipped to North, South, or Latin America, to all countries in Europe, to all countries in continental Asia, to Australia.